SEPT 24: MATINS: 7:00 AM, DIVINE LITURGY – 10:30 AM; SEPT 26: DIVINE LITURGY – 11:00 AM; SEPT 27: DIVINE LITURGY – 6:00 PM. The Gospel today, Luke 5: 1-11, is about the Four Fishermen Called as Disciples. In one of today’s Gospel reading, Christ comes upon several men, Sts. 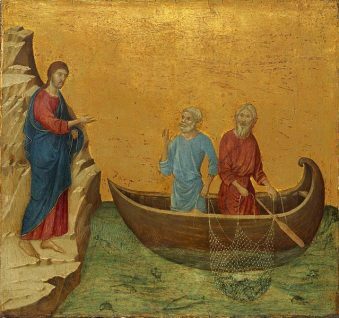 Peter, James, and John who, the Gospel says, had been fishing all through the night and had caught nothing. After spending some time teaching His message, Christ turned his attention to the fishermen. 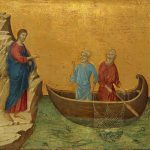 At the Lord’s bidding, they returned to their boats and, putting their faith in Christ’s words, once again let down their nets. And they caught an abundance of fish, enough to break the net, enough indeed to fill two boats and to cause both nearly to sink. Peter seeing this miraculous catch of fish, confesses to the Lord that he, Peter, is a sinful man. Christ responds that while they now catch fish, soon they shall be catching people. Christ was teaching his followers that they must put their trust in Him, even when it seemed a waste of time, even when it seemed foolish, even if they thought they knew better. The second message is that though we try in our lives to accomplish certain things, and fail, we must never cease trying, we must never give up. On September 23rd, we celebrate the conception of John the Baptist. St. John’s parents, Elizabeth and Zechariah, are told in scripture as a faithful couple who ask God for a child but cannot conceive. They are also elderly. The angel of the Lord comes to Zechariah and tells him they will have a son, whose name will be called John. He will be great in the sight of the Lord. This news is so surprising that Zechariah is struck dumb. On September 26th we also commemorate the repose of John Apostle – Evangelist. The Apostle John was especially loved by Jesus for his sacrificial love and purity. After his calling, the Apostle John did not part from the Lord, and he was one of the three apostles who were particularly close to Him. St John is known as a witness to the Transfiguration of the Lord on Mount Tabor. During the Last Supper, he reclined next to the Lord, and laid his head upon His chest. He also asked the name of Jesus’ betrayer. He followed after the Lord when they led Him bound from the Garden of Gethsemane to the court of High Priests. He was there in the courtyard of the High Priest during the interrogations of Jesus and he resolutely followed after him on the way to Golgotha. At the foot of the Cross he stood with the Theotokos. He served Her until Her Dormition.